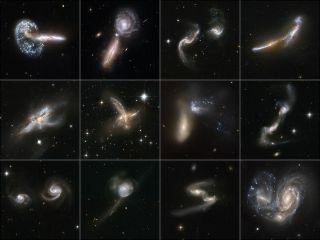 Galactic collisions abound in the universe, as Hubble has shown repeatedly. WASHINGTON — For most of its 25 years in space, the Hubble Space Telescope has been amazing people around the world with its beautiful images. But the spacecraft — a collaboration involving NASA and the European Space Agency — produces much more than pretty pictures. Its scientific instruments have revolutionized our understanding of the universe and its history, researchers say. Those expectations were met. Since Hubble's launch aboard the space shuttle Discovery on April 24, 1990, about 4,000 astronomers from around the world have used it to produce more than 12,700 scientific papers, making it one of the most productive instruments ever built. "Hubble really did open up the whole universe to us in a way that nothing else did," Hartman said. NASA's Hubble Telescope discovered four of Pluto's five known moons. The Hubble Space Telescope reached space with a flawed mirror and initially returned blurry images of the cosmos. But astronauts fixed the problem during a servicing mission in 1993, and Hubble began to produce the beautiful, iconic images for which it is now known. Not long after the fix, Comet Shoemaker-Levy 9 slammed into Jupiter. Hubble captured the comet as it broke up, offering insights into the role comets may have played in delivering water and other material to the solar system's planets, including Earth. Other images of Jupiter revealed unexpectedly low amounts of water in the atmosphere of the gas giant. NASA's most famous space telescope was named for American scientist Edwin Hubble, who determined that the universe is not static but expanding. One of the main goals for Hubble was to determine just how quickly the universe is stretching. The telescope has also provided evidence for the existence of dark energy, the mysterious force that counteracts gravity, causing galaxies to move away from one another at an accelerating pace. In 2008, Hubble captured the first photograph of a planet beyond the solar system. Our Milky Way galaxy is set to suffer a head-on collision with its neighbor, the Andromeda galaxy, and the world has Hubble to thank for the heads-up. By measuring the sideways motion of the approaching Andromeda galaxy, scientists were able to determine that the two will merge in approximately four billion years. Mergers are common beyond the Milky Way, as Hubble has shown. When scientists discovered galaxies with long tails of gas and dust — the remnants of mergers — they turned Hubble toward them to reveal details. The space telescope probed the core of these collisions and uncovered a new class of exceptionally large and bright star clusters. Hubble has helped survey galaxies that existed when the universe was only 600 million years old. Previous estimates had suggested that galaxies didn't form until the universe was at least two billion years old. The instrument's images have helped scientists understand how galaxies evolve. Hubble also helped turned a staple of science fiction into science fact. "When I was a young kid, black holes were fantasy, something on 'Star Trek,'" Ed Weiler, who served as NASA chief scientist for Hubble from 1979 to 1998, told Space.com. But Hubble showed that supermassive black holes, which weigh in at millions or billions of times the mass of the sun, exist at the center of most if not all galaxies. "Hubble has not only proved that supermassive black holes exist; it has taken black holes from science fantasy to reality," Weiler said. By capturing images of a special class of pulsing stars, Hubble helped astronomers to measure the age and expansion of the universe. When massive stars reach the end of their lives, they explode in a fiery death known as a supernova. These violent blowouts may leave behind black holes or supercompact neutron stars even as they blow the heavy elements that form in the heart of the star through their galaxy. Hubble has helped scientists to better understand the supernova process. Since it first began photographing the universe, Hubble has captured images of SN 1987 A, a supernova that exploded three years before the telescope launched. Hubble has continued to observe the supernova, taking hundreds of pictures to help researchers understand how it has changed over time. Hubble has also put in time studying the unstable star Eta Carinae, an object that appears to be an explosion in progress. The telescope has allowed scientists to make detailed studies of the structure of the unusual object, including the remnants of the violent outbursts it has experienced for 200 years. Today, when people hear about exoplanets, the first instrument they probably think of is NASA's planet-hunting Kepler spacecraft. But in 2008, Hubble captured the first photograph of a planet in orbit around another star, Fomalhaut b. Even before that, Hubble helped to find 16 potential planets orbiting other stars by monitoring the dips in starlight as each planetary candidate passed between its star and Earth. The instrument has also helped to study the atmospheres of distant planets. Indirectly, Hubble helped to set the stage for Kepler. Hubble revealed billions of stars that were potential planetary hosts, opening up the immensity of the universe. And putting Hubble into space demonstrated that a level of technological expertise had been met, NASA officials said. "It became reasonable to think we could build something like Kepler," Hartman said. Hubble was designed to be serviced, allowing astronauts to replace parts as needed and to change out the scientific instruments. This approach has kept the spacecraft operational for a quarter of a century. The last servicing mission in 2009 replaced worn parts, and Weiler estimates the craft will keep collecting data for another five or six years. John Grunsfeld, associate administrator of NASA's Science Mission Directorate and a former astronaut who serviced Hubble on three different space missions, lauded the spacecraft at the screening of "Hubble's Cosmic Journey." "Hubble still has a tremendous journey ahead of it," Grunsfeld said to a packed auditorium. "I'm still convinced that its greatest discovery lies ahead." Editors note: This story was corrected to say that Hubble has been operational for a quarter of a century, not a quarter of a decade.